After recently moving in to a new house I had a great urge to buy fresh flowers to display to brighten the place up a bit. When I was sent a gorgeous bouquet from OK Bouquet I knew that they would be the perfect addition to my new home. OK Bouquet is owned and run by Rosario ‘Ross’ Rospo, who started selling flowers at the Columbia Road Flower Market at the age of 14. He then went on to own 3 successful flower stalls in Bishop’s Stortford, Hertford and Columbia Road, selling both cut flowers and beautiful bouquets. He has been described as creating a “masterly floral panorama worthy of an artist” on his stall, and has a long-standing reputation for selling only the highest quality flowers. Ross noticed a gap in the online market for the type of bouquets he creates – natural, informal looking ‘big’ bouquets, bursting with the freshest, highest quality flowers and at an affordable price and this is how OK Bouquet was born. I received this massive bunch of flowers called the Premium Coral Pink ‘Miss Piggy’ Long Stem Roses. 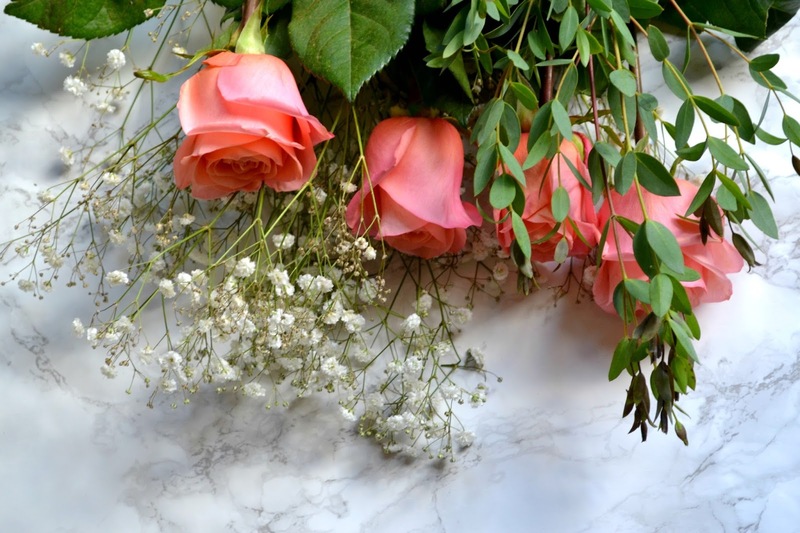 These beautiful roses are perfect for romantic occasions, anniversaries or simply because they’re beautiful! Coral roses are often associated with desire, passion and romance. I had to split them into several vases as they were so big. When ordering a Bouquet you can add your choice of foliage. Mine came with bright white gypsophila which really complemented the coral colour of the roses. They are absolutely stunning. OK Bouquet offers a guaranteed next day delivery throughout the UK but you can order well in advance if you require them on a certain day. Only the freshest flowers are chosen and the bouquets are put together just before displace to ensure they are at their freshest. I received long stem roses which lasted a lot longer than the usual flowers I get from the supermarket. The superb quality really stood out to me and it was nice to have flowers that stayed looking lovely for longer. What do you think of these flowers? I think they are the perfect gift for any occasion. *I received this bouquet free of charge in exchange for an honest review. All opinions are my own and I was not influenced in any way.